OBJECTIVE: Very low-carbohydrate diets are widely used for weight loss yet few controlled studies have determined how these diets impact cardiovascular risk factors compared to more traditional low-fat weight loss diets. 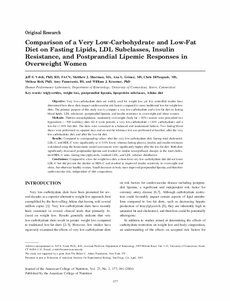 The primary purpose of this study was to compare a very low-carbohydrate and a low-fat diet on fasting blood lipids, LDL subclasses, postprandial lipemia, and insulin resistance in overweight and obese women. METHODS: Thirteen normolipidemic, moderately overweight (body fat >30%) women were prescribed two hypocaloric (-500 kcal/day) diets for 4 week periods, a very low-carbohydrate (<10% carbohydrate) and a low-fat (<30% fat) diet. The diets were consumed in a balanced and randomized fashion. Two fasting blood draws were performed on separate days and an oral fat tolerance test was performed at baseline, after the very low-carbohydrate diet, and after the low-fat diet. RESULTS: Compared to corresponding values after the very low-carbohydrate diet, fasting total cholesterol, LDL-C, and HDL-C were significantly (p < or = 0.05) lower, whereas fasting glucose, insulin, and insulin resistance (calculated using the homeostatic model assessment) were significantly higher after the low-fat diet. Both diets significantly decreased postprandial lipemia and resulted in similar nonsignificant changes in the total cholesterol/HDL-C ratio, fasting triacylglycerols, oxidized LDL, and LDL subclass distribution. CONCLUSIONS: Compared to a low-fat weight loss diet, a short-term very low-carbohydrate diet did not lower LDL-C but did prevent the decline in HDL-C and resulted in improved insulin sensitivity in overweight and obese, but otherwise healthy women. Small decreases in body mass improved postprandial lipemia, and therefore cardiovascular risk, independent of diet composition.